I’ve just come back from a quick break in the Cordyline County, and things are looking good there. 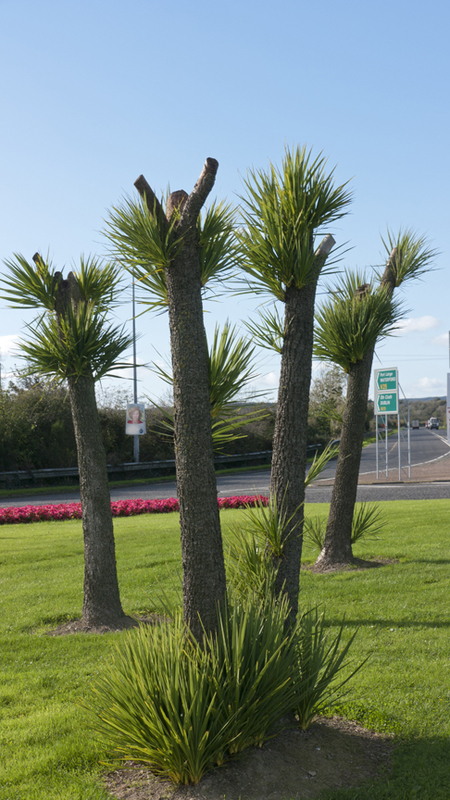 Yes, the cabbage palms of Wexford are recovering well after the ravages of last winter. If you remember, we talked about these New Zealand natives already on One Bean Row (here). I’m very keen on them, but not all of you agree with me. Some commenters were less than cordial about cordylines. So, I feel I should reiterate a few of their good points: they have huge sprays of lily-scented flowers that are beloved of bees, and the waxy berries that follow are full of fats, which makes them a valuable bird food. And, of course, their moppy heads of strappy leaves give one the feeling of being permanently on holidays (see photo above). Cordylines don’t suit all climates, but in milder areas of Britain and Ireland (and elsewhere), they are happy. If you want a sturdy tree with great shape for a tropical-looking scheme, the cordyline is the one for you. If you want a tree that will take the saltiest gales that the sea can throw at it, the cordyline is the one for you. And if you want a tree with foliage that will provide you with fibres for rope or heavy clothing, and with roots that are full of natural sugars, then the cordyline is definitely the one for you. Okay, I doubt that any but the most ardent sustainability proponent will actually weave or eat the cordyline, but at least these qualities make a good conversation starter — if you happen to be at a loss for words next to a cabbage tree. Stuck for conversation? Let's talk cordyline. There are many different varieties, including a smart, stripy cultivar (‘Torbay Dazzler’) and numerous glum-looking, plum-coloured ones, but the sturdiest of them all is plain old Cordyline australis. The others rarely make it to a great age. Oh yes! Fresh young shoots, lots of them, are pushing out from the thick elephant-skin bark. You see, this cordyline is really as tough as old boots (in fact, you could probably weave a pair from it). In time, the old tree will completely regenerate. It will be a bristling green stump for several years, but eventually, the limbs will elongate and will once again hoist themselves proudly over the six-acre walled garden. 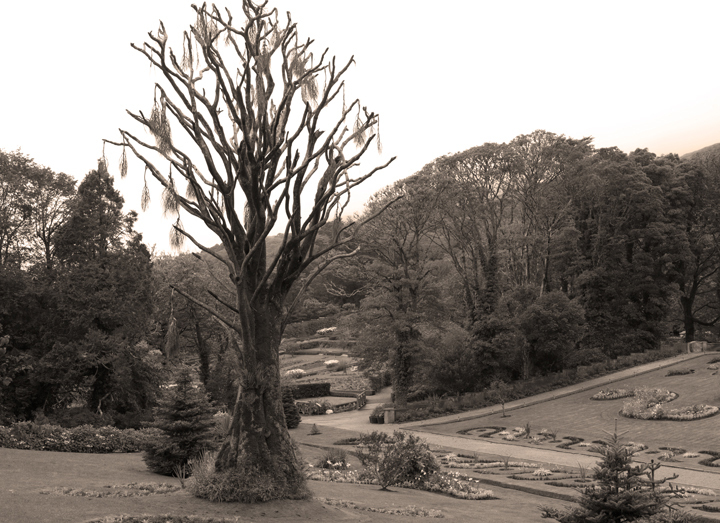 The dead bits have been expertly removed, and the trees are rebudding from trunk and base. Incidentally, if you are the owner of a back-from-the-dead cordyline, it’s too late in the year for serious surgery. You can nip away some of the horribly limp and squidgy bits, but don’t go right down to the new growth. There is a good link here on the Paramount Plants and Gardens blog that describes how to treat damaged cordylines — but it is advice for next year, not now. 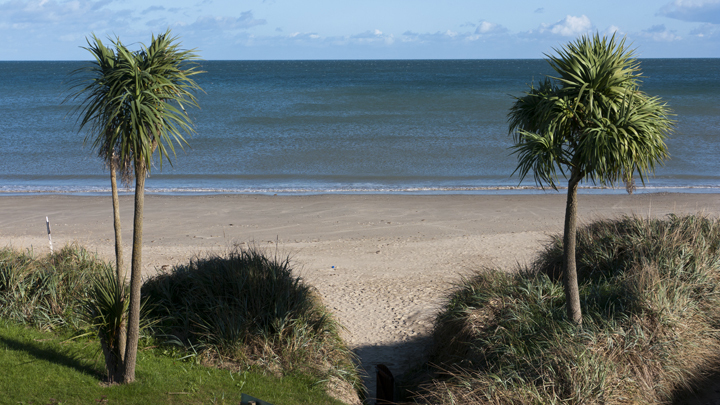 In case you are wondering, the caerulean sky-and-sea photos at the beginning of this blog post are at my favourite restorative hotel in Ireland, Kelly’s in Rosslare — where the sun always comes out for at least a portion of your holiday. 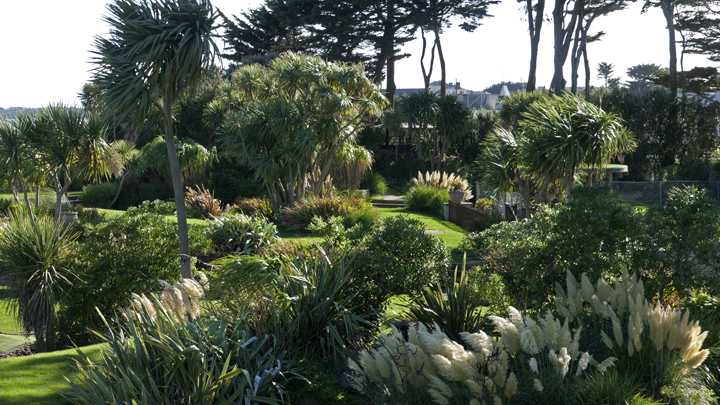 The garden — which conceals a mini-golf course — is a masterful piece of design: all the plants are suitable for a windswept coastal situation, and there is something flowering, fruiting or otherwise showing off all year round (Tulbaghia, Nerine, Rosa rugosa and pampas grass in October). It was designed by Angela Jupe and Sandra Cosgrove. And, because there are cordylines in plenty, a person is never short of conversation. Dreadful trees! should you wish to put one in your garden beware! do not put them anywhere near a bedroom window as whoever is sleepiing in that room will not get a wink on a windy night as they make a terrible noise, also the fallen leaves do not compost, I will agree that they are a very good tree for caostal areas. Thank you, John. People either love them or hate them! I feel I should be keeping a tally here. For: 1; against: 1. Almost all Cordylines in England perished in the last two winters. Most never got to the tall palm-tree like form that you show, most were bare stalks with a spiky tuft on top. So I’m in the ‘no’ camp on cordylines, I’m afraid. Yuccas have done much better here in Cheshire, even the variegated ones. For us cold-climate New Englanders, who only know cordylines as 2-foot spiky accent plants in a pot, it’s wonderful to see them all grown up. Put me in the “for” column! We used any excuse to get rid of them, one I remember, dug around, dug down to roots, chopped, sawn, and worried to half a metre below ground, neat glyphosphate poured on it, 4 thick plastic bags tied over it, and buried again, came up again, bless it, 18 months later………………..
We used the bad winter as the best excuse yet (and the only good aspect of 2010 winters) to cut the rest down…………………..all gone and good riddance, but………………………………. They do have a great look when really large, good structure and all that, they are one of the few plants that can survive with parrots (no doubt why they are so tough, co-evolution and all that), and bees love the flowers……………………….. Lets say I respect them then, but I cannot say I like them! Poor Stephen! But, oh, I love a cordyline-hater. I understand all your points, and I sympathise, but I still like them. The one across the road perfumes a long stretch of our neighbourhood, and it has kept many birds from starving over winter. I planted my own this summer, but it will be a while before it flowers. I’m in the “yes” group, as we have a sea and salt-laden garden in Sutton Co. Dublin. 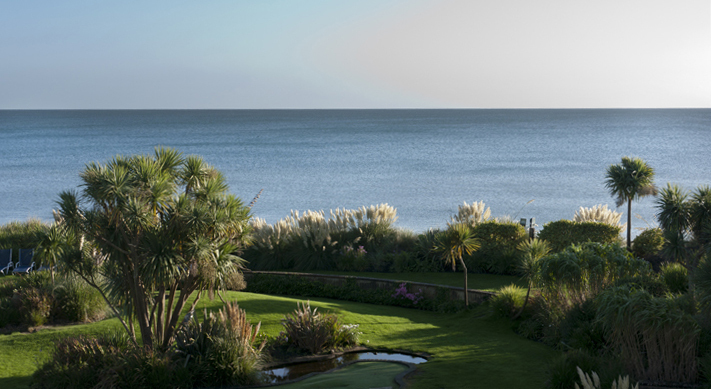 We have six cordylines in two rows, moorish style, in the front garden, which is covered in beach pebbles. They give a great tropical feel to our garden, in sunny or stormy weather, in summer or winter! I am for Cordylines. The irony of these tropical monocots standing tall and proud in our cool damp climate never fails to amuse me; so snow-laden Cordylines a hoot. Happy to see them regenerating….. They certainly must have a Lazarus quality about them. Resprouting from apparently dead trees is amazing but I cut down two “dead” cordalines and used the trunk of one as a retaining wall for a small raised bed. 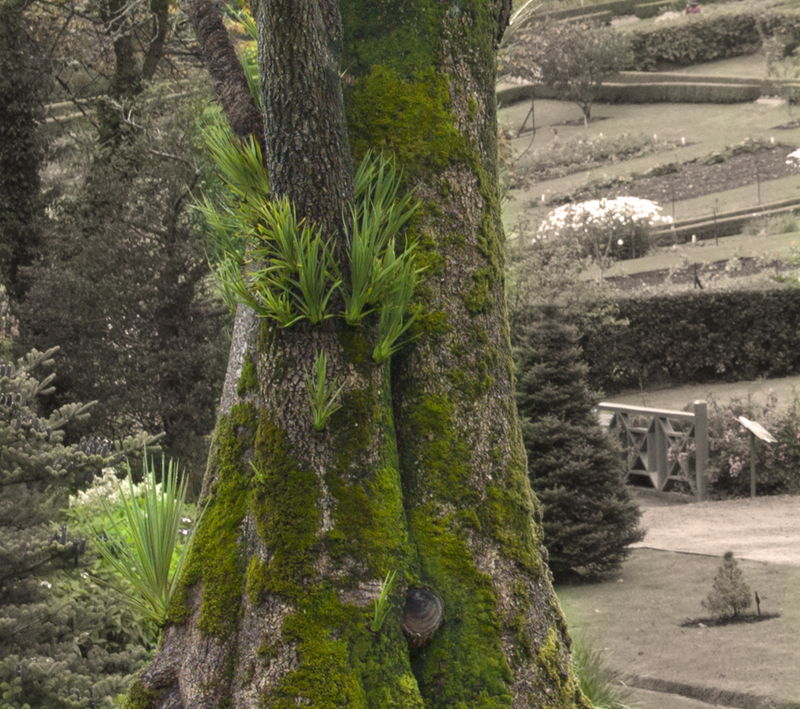 Now, it is more than amazing that this trunk has two new shoots growing from it so I must admire the cordalines for their persistence at least. You are currently reading Cordyline the Lion-Hearted at One Bean Row.